1) Dear oh dear, Penguin Books (NZ). Did nobody even bother to double check the content of the new Tui New Zealand Fruit Garden book released this week? Not only are there rather too many errors, but there seems to be a certain amount of what might be called plagiarism going on – a bit too much cutting and pasting from easily traced overseas websites (even Wikipedia – who cuts and pastes from Wikipedia for a book?) and none of it seems to be attributed. 2) A woodland plant supreme – now Farfugium japonicum argenteum but still often referred to as a ligularia. 3) Autumn is well and truly here and we advise taking full advantage of the continuing fine, calm and dry weather – garden tasks for this week. It is feijoa season here. 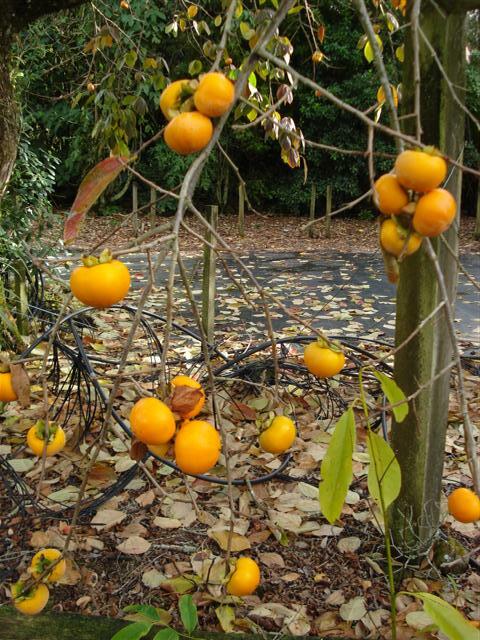 This is a fruit from South America which we have almost made our own in mild areas of New Zealand. The plant grows to a large evergreen shrub which is amazingly forgiving, tolerating even salt winds so it is sometimes used as hedging. Good forms will fruit prolifically. When our children were little, we had a row of four old plants along a roadside boundary and they would routinely head outside with a teaspoon to sit under the trees and eat their fill. Now that they have all left home and live in places where the humble feijoa is virtually unknown, they get very nostalgic when I tell them the fruit is falling. 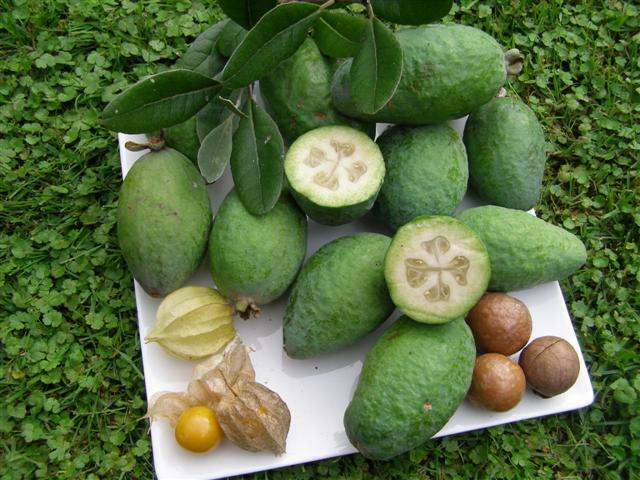 For those who have never encountered a feijoa (and they don’t transport well so while they are sold dirt cheap in fruiterers and on roadside stalls locally, they are not generally shipped elsewhere), the common method of eating them is either to scoop out the centre with a teaspoon or to peel it and eat the whole centre. There are no bothersome pips or stones. And just to show how mild we are, the physalis (referred to here as Cape Gooseberries even though they too are South American) seed down and pop up around the place and we even grow macadamia nuts successfully. We are right on the margins of suitability for growing macadamia trees and we get occasional years when fruit set is aborted, but in the main they crop consistently for us. It is just a shame they are so difficult to get out of their shells because they are a Rolls Royce nut of choice. This entry was posted in Tikorangi notes and tagged autumn fruits, feijoas on 6 May 2010 by Abbie Jury.